Like many train stations across Europe Hlavni Nadrazi (Prague’s Main Railway Station) has it’s rather seedy and suspect corners where commuters pass through quickly in order to make their appointments. Surprisingly, a once seedy corner in the park surrounding the station has sprung up a fantastic playground popular with both locals, tourists and commuters alike. The playground is surrounded by a lush park, established trees throw down shade and pretty flowers and bushes align the perimeter fence. A full-time guard is on duty at all times to ensure that the playground is safe and free of undesirables. 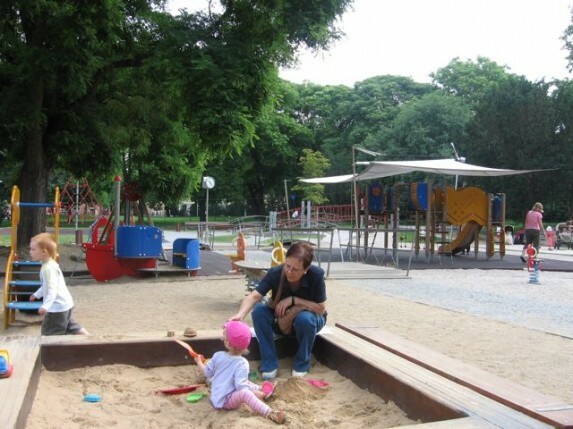 They also make sure that rubbish is disposed of and keep the sandpits raked, sweep up small pebbles and open up the shade covers that hang above the equipment to keep children sheltered from the sun. An added bonus is a thick rubber mat that covers many of the play areas, this lessens the chance of kids having a serious accident. 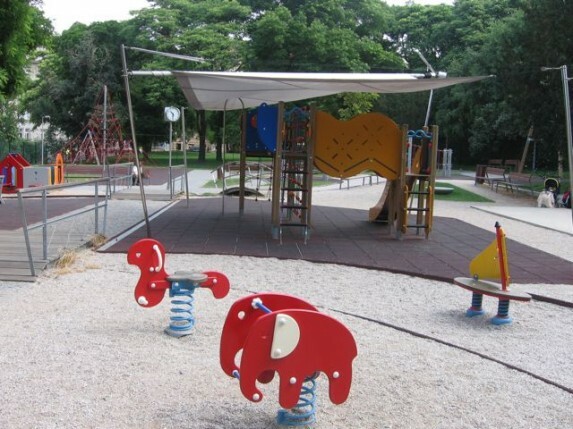 Even more appealing is that the playground is designed around a ‘Prague’ theme. The ride on animals represent Prague Zoo, the playhouse is Starometske Namesti, the play frame with slide is Hradcanska, a rope bridge is Karluv Most etc. etc. This explains the curvy pebble path that runs through the playground crisscrossed by small wooden bridges and occupied by two fetching boats - the path is the Vltava river. If you find your imagination stretched then a sign at the entrance of the park explains exactly what every piece of playground represents. Older kids will appreciate the large climbing tower built with ropes and the zip line (or flying fox as we call it in Australia) that whirls kids from one end of the park to the other. There is also a small slide and 3 sandpits for the young ones - all ages will find something to their liking. Conveniently, there is a well maintained modern toilet at the playground as well as plenty of benches under trees or in the full sun. This is a great meet up spot for mothers groups all over Prague due to the excellent public transport connections and it’s also a reasonably short walk to the city centre. DIRECTIONS: Catch metro C to Hlavni Nadrazi, metro B to Namesti Republiky or metro A to Museum. Trams 9, 26 and 5 are even closer to the park and playground. The street directly in front of the park is designated metered parking so driving is an option.